Labour has extended its lead amongst would-be-voters in Lincoln in an independent online survey focusing on the policies of each party. As of April 20, 1,581 potential voters in Lincoln have completed the Vote for Policies survey online. The size of the sample has almost doubled since the The Lincolnite first reported on the survey on April 9. Labour has increased its lead slightly in that time, with 30.1% of respondents’ answers now matching their policies, with the Liberal Democrats over 10% behind in second. The Conservatives, who won the constituency in 2010 and are the fighting with Labour to retain the seat, continue to trail in fifth place, just behind UKIP. The Green Party, who failed to put forward a candidate, remain in third place in the survey. 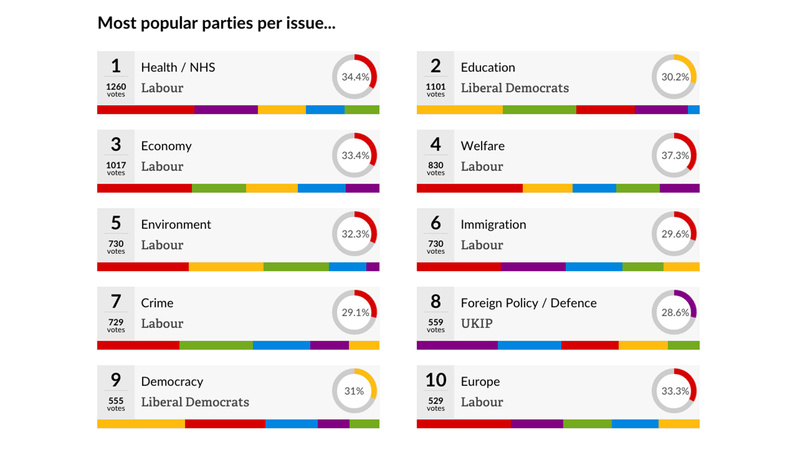 In terms of individual policy areas, Labour leads on its policies on health, the economy, crime, welfare, immigration, Europe and the environment. The Lib Dems are favoured by voters on their education stance, with UKIP polling the highest out of all parties on foreign policy and defence. To take part in the survey, users are first prompted to select a number of key issues (the economy, crime, health etc) that will determine how they vote in the general election on May 7. They are then directed to the issues that they have selected, and are given an outline of each party’s policies in that area. Crucially, the names of the parties are not shown alongside their set of policies, which should in theory allow for more honest and truthful answers. Respondents are asked to create a shortlist of the policies they broadly agree on and are then prompted to choose those which they agree with the most. The survey pulls together all the data submitted and reveals the party that best reflects the user’s political beliefs based on the information received.